In the unity launcher, the trash icon on the bottom need to be changed, I attached the natty interface mock-up, png of trash icon, as below, as well as a new version of vector file, it is only with empty version of trash in it, and need for further editing. We are still working on adding glow and gradient on it, and also making a full version trash icon. See also bug #715611 ("Trash icon should indicate when it has deleted elements") which covers the tweaks to unity to make sense the two separate icon-states are requested. Nota bene: the icon assets were briefly included. The request is now however superceded by bug #761421 ("UIFe: Launcher: 'user-trash' and 'user-trash-full' are neon-on-white lens. Should be Humanity") and the trash icons are intended to return to the Humanity versions. this is natty mock-up, trash icon is on the bottom left. vector trash icon, without glow and gradient. Rosie! Thank you, are you also going to do a 'user-trash-full' full icon? Is there a mock-up for that? What's it blocking on and is it anything that I can help with? (I can also sit down and give you a hand with the SVG glow now that (thanks Otto!) we've remember how to do it with duplicatin and bluring, rather than trying to use custom gradients. These icons need to go into Ubuntu-mono icon theme. It is the default icon theme. 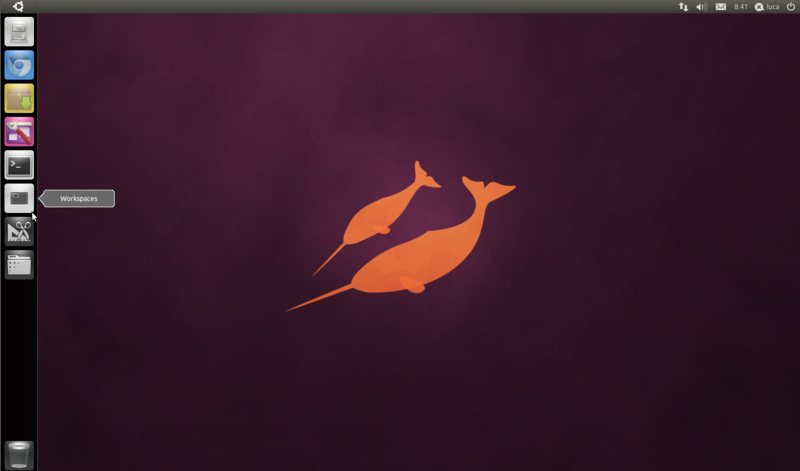 Adding the icons to ubuntu-mono icon theme is the right way, changing Humanity icons is not the right way.. So, "user-trash" would be "user-trash-unity" (or whatever name Unity folks prefer) and to make sure there is a fall back if themes do not have the icon name "user-trash-unity" to use "user-trash". Which is better? "user-trash-unity" or "user-trash-symbolic" or "unity-user-trash-symbolic"? Either "user-trash-unity" or "user-trash-symbolic" is fine, but definitely not the third option. The last one breaks fallbacks as per icon naming schemes. "user-trash-symbolic" would be the best way to go, since -symbolic is something which we are definitely planning to do. We do plan to merge ubuntu-mono-dark and ubuntu-mono-light into one theme when we have the symbolic icons working similar to GNOME3. To have crisp icons, straight lines *need* to be pixel aligned , otherwise the lines will be blurry. What i notice in vector_icons_24_03.ai , is that the "_" and "|" lines inside the workspace switcher are blurry, you can fix that by aligning the lines to grid. I can also see them in the trash icon, but less prominent than the workspace switcher. If you are using inkscape, turn on the grid view, it will help you with aligning to grid. Regarding grid-fitting, huge amounts of effort ultimately goes into grid fitting/aligning (aka "hinting") to certain pixel counts. Hinting is an optimisation stage to improve the clarity of what /is already there/ and so for something like UI Freeze the focus is instead to get the raw image there, and to optimise it later if needed. As an example with fonts, if we designed a font on a 8x16 grid we would have an excellent, labour intensively-produced (bitmap) font, but not something that was pretty when printed, or which it was possible to scale up to 9x17 pixels. In Unity today, the Launcher is already a resizable entity. 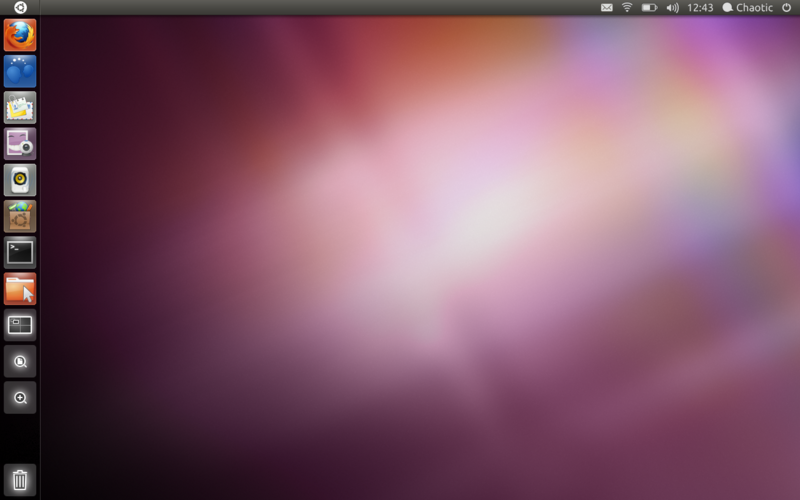 You can try it by going to CCSM->Ubuntu Unity Plugin->Experimental->Launcher Icon Size and moving the slider. In the medium-term this resizing is likely to correspond to physical size to fit physical dimensions such as fingers. If the movement causes the size to of the icons to need to be even 49 pixels or 51 pixels then any attempt at grid-fitting will have been undone and the result would have been a huge amount of premature optimisation. When hinting line-art, icons or fonts, one tends to start off by drawing what is actually desired. As the density of screens continues to evolve it is becoming desirable to have a vector form available with that level of flexibility. We can of course then continue to work on specific (and labour intensive) optimisations of the general case for certain specific pixel counts, ...but the gain has to justify the work involved. The gain is far greater when the icon form is known as a definite. Which might be something to look at next week, but having manually hinted variants isn't critical for UI Freeze, compared to just getting *something* on the right part of the screen, showing the intended shape before UI Freeze. Btw, I'm not commenting about the style, but only about the icon not being grid-aligned. Fonts and icons are completely different. Fonts get hinted, but Icons *need* to be pixel aligned *when drawn itself* . And what you draw is how icons get displayed in GNOME/GTK. If the icons are not aligned to grid then the end displayed result is also not grid aligned, and the lines *will* be blurry. Checkout > http://launchpadlibrarian.net/67161081/Schermata.png from Bug #741517 . The inside lines are barely visible. That is because the icon is not drawn in alignment to grid. Why do you think Icons in humanity,ubuntu-mono are pixel perfect? We have taken care to align them while drawing and we take care to draw the icons for the required sizes. Depending on scaling is not the way to go either. Icons need to be done for their sizes, else we will have blurry icons. We still dont have any clever system for icons/svg in GNOME. If Otto is not aware of these limitations too, I would suggest someone let him know about it. Vish: "Icons need to be done for their sizes", indeed. This is the point I had attempted to highlight above; my apologies for not having managed to convey that clearly. * To be able to hint/draw against a grid, one must first have a grid. * To be able to document the characteristics one must know the specific use-case(s). Not all grids are affine, and not all grids are 1:1 ratio in their cells, and not all grids have the same number of texels in each axis. Example 1: As an extreme example, the magic on-pitch advertising at televised sports events is drawn (by a human painter with a bucket of paint) against a non-affine, non-linear grid; and that grid is chosen beforehand based on a use-case of one particular camera location, angle and viewpoint. One could, of course, take a random image and scale/transform/interpolate it to fit, but it's not going to be as pretty when seen by the television camera as something optimised for one use-case and painted with carefully-aligned high-contrast edges. (To get it absolutely perfect, ideally one would know the focal-length of the camera lens and the internal CCD pitch too ;-). Example 2: As another example, to grid fit for something like the OLPC display you would need two grids, one to hint/draw/align the luminance against and another grid to hint/draw/align the coloured-fills. The human designer creating the hinted form would need to have knowledge of both grids in order to be able to draw a completely grid-fitted variant. Example 3: As a third example, it's only recently that nominally 1:1 ratio displays have been the norm. For most of the 1980s and 1990s people were using VGA cards attached to CRTs and quite often using resolutions with a 1:1.2-ratio pixel ratio. The icons used for games like Doom were all (very) carefully drawn to be grid-fitted against an affine 1:1.2-ratio grid. To draw a circle against such a grid, there are going to be more texels in one axis than the other, but the result when rendered and shown to the game-player appears circular and naturally round. But, rotate that grid-fitted icon 90-degrees and rather than a circle, or slight ellipse, the viewer will now see a quite extreme ellipse. Another example in the same-setting would be the grid-fitted cross-hairs used for targeting. If you use various virtual-machine emulators, you may still see a double-jump in the window size during boot as the device comes up in 640×400. The inside icon is 38*28px, and all lines are either 1px or 2px, it might be the problem somewhere in exporting between illustrator and inkscape, its the bounding box was 52*52px not 48*48px. Sorry - I'm well aware that the icons need to be pixel aligned to a standardised size canvas. These had a 52px outline to represent their position within the bounds of a launcher tile and do actually require a different treatment for their tiles. The inclusion of this outline was an oversight on our part and I believe this is why they were rendering blurred. If the icon name for the trash were to change, please inform the Unity 2D team. @Paul: were the names of the icons changed? If so, what are they now? Florian: no icon names were changed. An upload of grayscale-icons was made via 'unity-asset-pool'/'unity-icon-theme' (bug #745555), and then reverted at the request of Mark back to Humanity style (bug #761421).